Who is a qualified HSA trustee or custodian? How much may be contributed to an HSA in 2004? May Health Savings Account money be used on medical expenses that do not count as covered expenses under the insurance policy? What happens to the money in my SHA that I don’t spend? If I accumulate a bunch of money (way over the deductible) in my HSA, when I reach retirement age can I use the funds for living expenses? Now that the deductibles have come down, will a traditional high deductible policy qualify? My policy has a $2,000 deductible per person. For my wife and me, that would be $4,000. Is it possible to have a Health Savings Account without the qualifying insurance? If I start my insurance coverage on June 15th, can I still fund up to the deductible? This sounds great. How do I set up a Health Savings Account? I work in a seasonal business. My busy times are Christmas and the 4th of July. Can I just fund my account at these times, or do I have to do it with my regular insurance billing? Any “eligible individual” can establish an HSA. An “eligible individual” is generally someone that is covered under a high-deductible health plan and is not entitled to benefits under Medicare (generally, has not yet reached age 65); and may not be claimed as a dependent on another person’s tax return. Generally, an HDHP is a health plan that satisfies certain requirements with respect to deductibles and out-of-pocket expenses. Specifically, for self-only coverage, an HDHP has an annual deductible of at least $1,000 and annual out-of-pocket expenses required to be paid (deductibles, co-payments and other amounts, but not premiums) not exceeding $5,250. For family coverage, an HDHP has an annual deductible of at least $2,000 and annual out-of-pocket expenses required to be paid not exceeding $10,000. Beginning January 1, 2004, any eligible individual can establish an HSA. 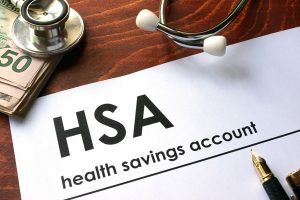 Prior to contributing to an HSA you must be enrolled in a qualified high deductible insurance plan and the HSA must be administered by a qualified custodian. MyBizBenefits provides a gateway search for HSA qualified insurance plans and a no fee HSA located on our HSA Quote page. Almost all common mainstream medical services can be paid from a health savings account. View a list of eligible and non-eligible services here. Who is a qualified HSA trustee custodian? Any person approved by the IRS to be a trustee or custodian of IRAs or Archer MSAs is automatically approved to be an HSA trustee or custodian. Any insurance company or bank can be an HSA trustee or custodian. Any eligible individual may contribute to an HSA. If established by an employee either the the employee or the employer or both may contribute to the HSA. For an HSA established by a self-employed (or unemployed) individual, the individual may contribute to the HSA. How much may be contributed to an HSA in 2005? For calendar year 2005, the maximum contribution for eligible individuals with self-only coverage under an HDHP is the lesser of 100% of the annual deductible under the HDHP (minimum of $1,000) but not more than $2,650. For eligible individuals with family coverage under an HDHP, the maximum contribution is the lesser of 100% of the annual deductible under the HDHP (minimum of $2,000) but not more than $5,250. Yes. This is another of the great advantages of the Health Savings Account. The typical American is out-of-pocket a considerable amount every year for medical expenses that are not covered under the insurance plan, due to the fact that the plan may not cover dental, or because of deductibles and co-payments. The individual is presently paying those amounts with after-tax dollars. If you have a daughter that needs braces for her teeth at a cost of $4,000, it typically means you need to have $6,000 in pre-tax income. With a Health Savings Account, you are going to cut out all of the extra cost by paying for dental work, eyeglasses, and other expenses not covered by the deductible with tax-free money from your Health Savings Account. Yes, but money withdrawn before age 65 for non-medical purposes is subject to income taxes and a 10% federal excise tax. What happens to the money in my HSA that I don’t spend? At the end of the year, the money not spent will simply continue to earn interest. Medical Savings Insurance pays 5% interest on any balance in the account. The interest is not taxable if you use it for medical expenses. Yes. At age 65 the HSA functions like a traditional IRA. You can withdraw money without penalty, paying only normal income taxes. And after retirement you can still withdraw the accumulated HSA savings tax-free to pay out-of-pocket medical expenses- like nursing home care and other expenses not covered by Medicare. No, that plan won’t qualify. The law is specific and clear. For a family (2 or more persons), the deductible must be one family deductible (all covered expenses add up to one deductible). The traditional high deductible policy does not fall within these requirements. No, the deposits are pro-rated by month, so if you start July 1, you can only put in 6/12ths of the deductible in the Health Savings Account. Funding the account is extremely flexible. (Don’t forget, the amount is totally optional). For ease and convenience, we can just add the deposit to your insurance bill. Or, you can use one of our deposit envelopes and mail us a check whenever you wish. As a matter of fact, you have until April 15th of the following year to make a deposit to your Health Savings Account.